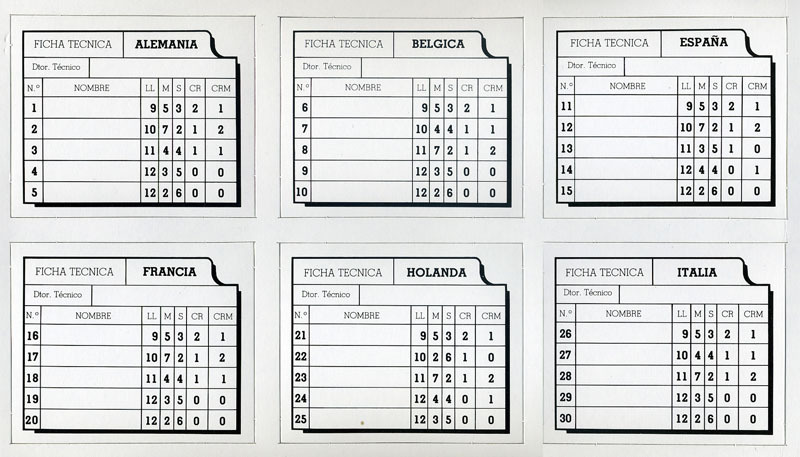 Here is an ambitious (and quite rare to find) Spanish game. Quite big (the box measures 50 x 35 cms, the open board is almost 70 x 50). 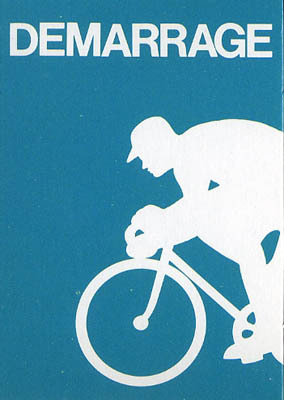 I would classify this one as "ambitious" because the game covers almost every aspect of a cycling race. 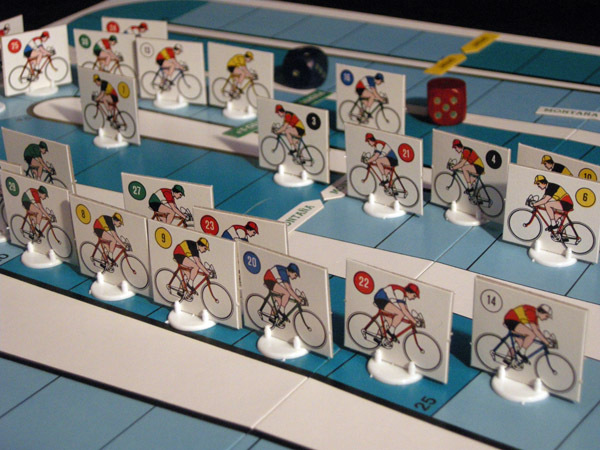 It features rules for ascension, sprint, time trial (even a different rule for mountain time trial), and provides mechanism to run a single race or a full Tour de France. The only thing missing is "pavés" (no cobblestones in Spain) and a rule for slipstreaming. The board is customizable with the provided little arrows. It is just a plain 100-field board. The two shades of blue do not mean anything, they are there to make it easier to count. 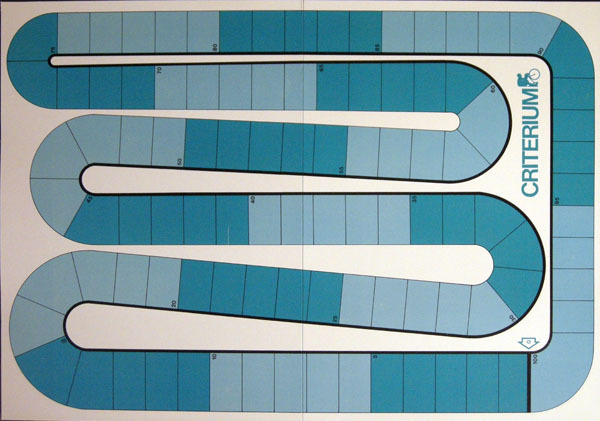 Before the race you must decide how long will it be (recommended: 150 to 250 squares long for a one-day race, that is one and a half to two and a half laps) and where you place the different mountains and sprints. What is puzzling is that you have to remember (and possibly write down) in which lap are placed the mountains. In effect, it is recommended to have three climbs during the race, and each climb takes place in a different lap. The same applies to special sprints. So you end up with a board with too many arrow pointing at mountains and sprints that might or might not be there. 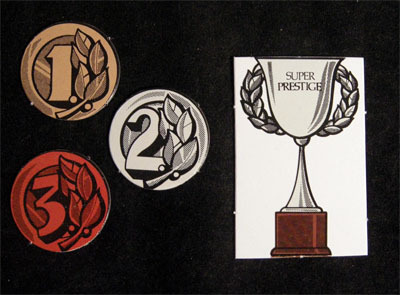 The first serious drawback of the game is the quality (or lack of quality) of the materials. Everything is quite cheap, unfortunately (and the board is quite ugly too). But this can be bearable. The really serious problem with this game is that the strategy factor is missing. It is basically a roll and move game with VERY few decisions taken. What is curious is that the game is quite complicated for a roll and move game. We have six national teams of 5 riders each, and every rider has different abilities which affect the probability of having a good throw on a given type of road. 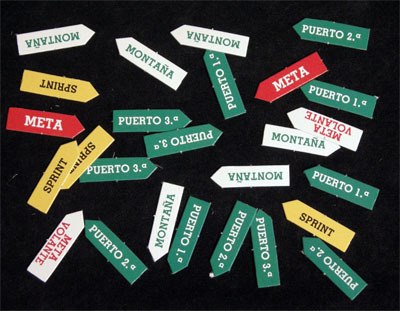 As you can see in the team cards, riders have values for flat road (LL = "llano"), mountain (M), sprint (S), time trial (CR = "contra reloj") and mountain time trial (CRM). If you have a closer look, you will notice that the teams are different from each other too. So it is not a balanced game. The mountain rule is quite strange. You still throw two dice, but you only advance the value of the blue one. The red dice is just added to the blue to see if you match the number on the card and you have an extra throw. ...though the rules mention something much more interesting. 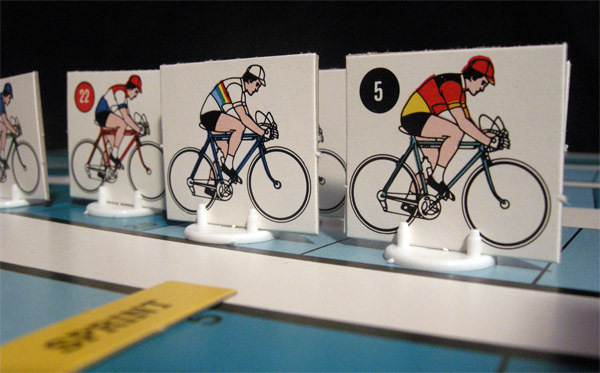 If shorter games are wanted, you may use fewer riders per team, and then choose them according to the design of the race. This looks more interesting. 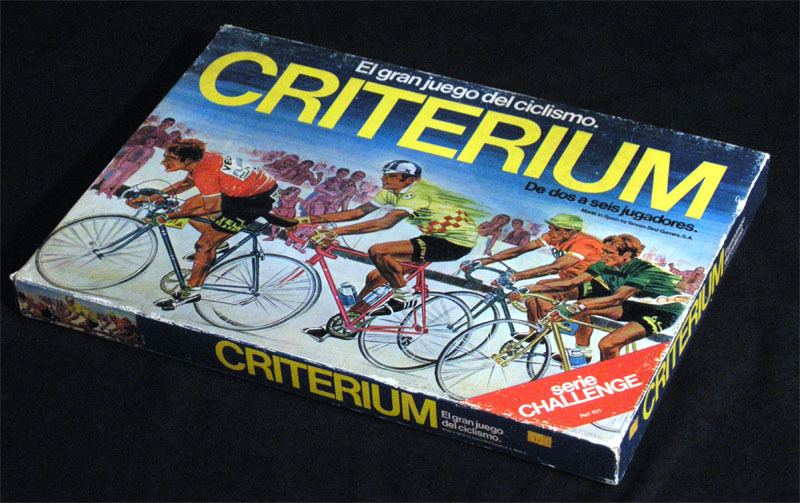 By the way, being a Spanish game from the seventies, it is logical that every one-day race is classified under "criteriums" except the world championship. That's the kind of cycling we had in Spain back then.